When I was very young, I asked my uncle for career advice. He went silent, thinking for a bit, and then said: “People who work sitting down make more than people who work standing up.” I’m not certain how true that really is, but my career as a technology professional has led me to work in a seated position for most of my life. Turns out, that’s a bad thing. Although I consider myself pretty fit, eating right, sleeping well and working out several times a week in addition to a morning walk with the family each day, I always look for low-barrier ways to stay healthy. When I first moved to the Pacific Northwest to work for Microsoft, I noticed several folks working at tall desks with no chairs. Some even had treadmills. I chalked it up to the ethos here; and certainly not something I would do. But this year that changed. I noticed that my back was a little stiffer when I got done with my 12-13 hour days of work. For the last couple of years, I’ve worked from home, so I don’t attend meetings (at least in person) as often or have to walk very far to do almost any part of my job. I start work around 6 in the morning, and sometimes get so focused that I don’t moved for many hours. I read an article on how bad sitting really is, and after further investigation thought I might give one of those stand-up desks a try. The research led me to believe that you don’t actually have to use a stand-up desk per-se, you can also use an alternate chair or just get up every so often. But I wanted to try this out, and figured that I would be more likely to take a break and sit every hour than I would to remember to stand every hour. My office desk is fairly typical, but I do have a decent office chair. That’s after going through probably six or seven chairs in the last few years. I have good lighting, a speakerphone, a web cam and two monitors. I also have the typical flotsam and jetsam of desk clutter, although I’m neater than some. This arrangement has suited me well since I’ve been working at home. I had something similar in an office environment, although I didn’t always have the option of a decent chair. I didn’t go through the trouble of bringing one of my own in; I just put up with whatever I got, or could “appropriate” from an empty office or conference room. My criteria were fairly simple: the experiment had to cost less than 100.00, and be at the proper height and size to hold my keyboard, trackball, phone and monitors so that I could type with my elbows staying at a 90 degree angle. After researching standing desks, 100.00 was going to be impossible, not even for a used one. I visited several thrift shops in the area (I do that a lot anyway to donate and to buy) and didn’t find anything that worked. Of course, when you’re faced with finding cheap furniture, you naturally turn to the most amazing store on the planet. Before I left, I measured the top area and height of my desk, and wrote down acceptable measurements based on how I high I stood, the stuff I needed the top to hold, and the distance I needed for my typing to be done at the right height. Measurements in hand, I headed to the store. I found a coffee table - a really cheap one (19.00) called (oddly) LACK and brought it home to begin the surreal process of assembling something bought at Ikea. Happily, this was REALLY simple. Four lag bolts hold the legs on, and eight screws punched into the wood (or at least wood-like) to attach the shelf. My original thought was that I would move the shelf up higher than the Ikea instructions, and then use the pull-out tray from my desk to put the keyboard and trackball on. However, that was not to be. On investigation I found that the tray was not hung underneath the desk, but attached at the sides. That meant I had to either buy another tray, or place the keyboard on top, necessitating standing two inches higher. Researching trays, I found they were terribly expensive. These things used to be everywhere, so I was surprised that they aren’t as easy to get as they once were. Off to the thrift store to see what they had. I found an older tray, but it looked flimsy. 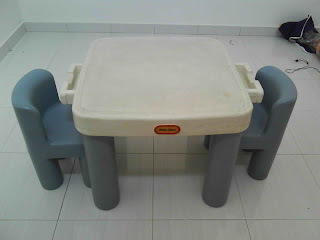 I then found a child’s plastic picnic table. The plastic was strong, and 1.5 inches thick. I figured I needed some padding to stand on anyway, so I bought the table, pulled off the legs, and wrapped some padding in an older rug. This brought the total cost of the build to 25.00 and 2.00 for an espresso and a cinnamon bun at Ikea (I would be burning these calories off with my new desk, after all). I re-routed all my cables, and everything fit correctly. The first day was easy. I thought - well I should have done this a LONG time ago! My back wasn’t that sore, and I didn’t feel that tired. Then I woke up the next morning. My feet were sore, although not terribly. The second day, I had to sit down each hour. Not just wanted to sit down - needed to. I play in a group at Church on Sunday, so I put my guitar in the office and spent 5 minutes each hour (roughly - sometimes I have calls that are longer than that) and practice a little sitting down. That helped a lot. I’ve now been at the desk for four days, and I don’t need the breaks as often. I also find I need to shift around a lot, which of course burns even more calories and is better for me. I honestly think the treadmill desk might be easier than a standing one. We’ll see if I go that far someday. The verdict so far? Glad I’ve done this. If it doesn’t work out, I’ll just re-purpose the coffee table and go back to sitting - although I’m pretty stubborn and will probably stick with this for a while. I’ll let you know if I change back, and why. My executive assistant hasn’t changed her office arrangement at all. She still keeps her (Ikea) chair just like she’s had it since she started working with me, and dutifully stays at her workstation for the entire 12-13 hours each day. We do, however, take our lunchtime walk still. She burns her calories that way, and thinks it’s better than just standing around all the time. I would have never thought to add a second desktop on top of your desktop, as opposed to raising the legs. That more modular from a functional perspective then just putting the legs on milk crates or cinder blocks, and has better wife acceptance factor. Regarding your sore feet. In my youth I worked in a burger king and a movie theatre concession stand. For both jobs, it took me a few days to get used to standing around all day, even though I did plenty of walking. Also, the internet agrees that <a href="indianapublicmedia.org/…/">standing is harder than walking</a>. I'm in the process of building a spin bike desk and a treadmill desk (once I find used parts for that one). I'll post a blog out on these projects once they're complete Buck. Until then, even though I have an office I find that I have an even cheaper stand up desk that I use for 4 hours a day – my kitchen island is perfect height and I use it from 8-noon each day before moving to my office. Thanks for posting this, Buck. Like Justin, I don't think I'd have thought of doing it that way. Now you got me thinking about trying it out at work. Oh, and I love that two-tone blue. Brings back great childhood memories. As I was reading in my mind was tryng to imagine what you will use to raise the coffee table to standing height. Did not think of this. I have a Lack table (small) laying somewhere and might give this a try. They were very helpful in explaining what I would get and actually making me a custom configuration of laptop shelf and monitor holder so my under-the-desk desktop's monitor and my work laptop fit perfectly side by side. No extra charge. I do have a stool that I sit/lean on. Sometime it cuts the circulation a bit… Need to work on that. Hi Buck, I couldn't pass up this topic. Great idea and solution. I currently get out of my chair and do a series of exercises in my cube each hour. This has helped, but I think standing would be even better. I plan on give this a try. I have a good friend (Jeff Zimmerman) that has been standing at his desk for years. With two good points of reference, I will give this a go.